Memory Maker is a fun and convenient way to have all your vacation memories in the same place. Memory Maker links your PhotoPass photos, attraction photos, and attraction videos to your My Disney Experience account through your MagicBand, Memory Maker Card Park Ticket, or PhotoPass card. How does it work? The PhotoPass Photographers will scan either your MagicBand, Memory Maker card, a Park Ticket that is linked to your My Disney Experience account, or, if you do not have a linked ticket, a PhotoPass card given out by the photographer. This will automatically connect any photos they take to your My Disney Experience account. 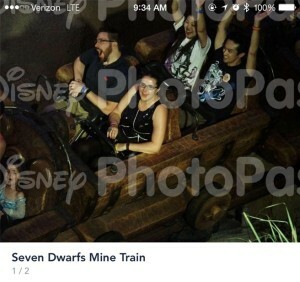 When you are on any of the attractions that have ride photos (listed below), through RFID technology, Disney automatically will detect your MagicBand and link your ride photo to your My Disney Experience account. A MagicBand is required for certain attraction photos and videos. All your photos will also be available to view through your My Disney Experience mobile app. This app is available for iPhone and Android devices. Even if you do not purchase a Memory Maker, the photos will still be available on the app and look like the photo on the right. (Thanks to the awesome MagicBand technology). You also have the ability to purchase Memory Maker right from the mobile app now, so maybe you weren’t sure if you wanted it before your trip but after seeing your photos, you decide its worth it, simply purchase it from the My Disney Experience app! Since the photos are available on the app, it makes downloading them to share across social media apps so much easier!! 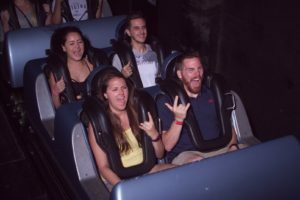 Tip: Keep track of your ride photo numbers just in case they do not show up on My Disney Experience. Give it at least 24-48 hours for the photos to appear and if for some reason it doesn’t, call 407-560-4300 with your missing photo numbers and they can add them to your account for you. Tip: PhotoPass photographers will also take pictures with your camera! All you have to do is ask. After your trip, you have a 45 day window from the date the photos were taken, to go through and edit and download your photos. Your photos do expire! You can also purchase a one time only extension of 15 days. Within the PhotoPass section of My Disney Experience, you can edit the photos by adding borders or other special effects to the photos. Once you are ready, you can download the photos as much as you would like within your time frame. The photos will be in a Zip file, so it is easiest to access them through a computer. The cost of Memory Maker includes the rights to use the photos however you would like. The Memory Maker website provides different options for printing the photos, as well as photo gifts including Photo Books, Photo Calendars, and Photo Greeting Cards. However, since you have the ability to use the photos how you see fit, you can upload them to other websites, such as Shutterfly and Snapfish, and get great deals on photo prints and gifts. I personally prefer Shutterfly and they just added a Disney line to their products, so you can make all kinds of cute Disney products with your pictures! 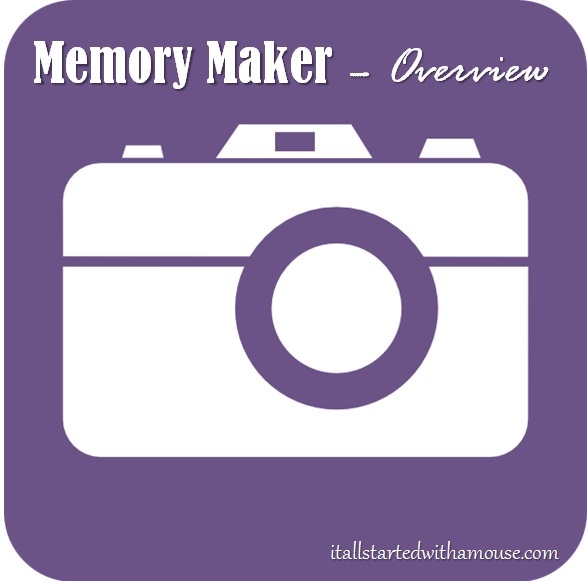 Tip: You can share your Memory Maker! Going with a large group? Or perhaps your family is going down one week and your brothers family is going down the next? Link your accounts on My Disney Experience and you can all use the same Memory Maker as long as your trips are within 30 days of each other. Be sure to check the option to allow sharing of photos. Note: Only the person who purchased the Memory Maker and holds the entitlement will be able to edit and download the photos, however anybody who is linked can add pictures. Recently introduced, this product is only available through the My Disney Experience mobile app. The cost is $59 and will allow you to download the digital versions of any PhotoPass pictures taken within one day at the parks. The My Disney Experience mobile app is available for iPhone and Android. Is Memory Maker worth it? In my own personal experience, I do believe that it is worth the extra cost if you plan on fully utilizing the product. If you will ride the attractions with photos, visit lots of characters, are going for an extended period of time, or possibly with a large group. It depends on your circumstances whether you believe it will be worth it to your family. It is a large expense but when you consider the over-all cost of your entire vacation, it is a very small percentage, and your photos, along with your memories, will last a lifetime! Memory Maker is currently only available at Walt Disney World.